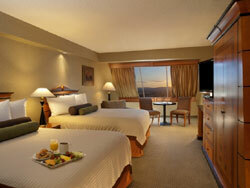 Luxor is a mid price range hotel on the Las Vegas Strip. It’s immediately recognisable as it is an Ancient Egypt themed hotel featuring a huge pyramid! Note – The theming has been dramatically reduced since the hotels 1993 opening. The hotel was remodelled and renovated in 2007. The hotel is now quite modern in appearance. One of the jewels in Luxor’s crown in the Bodies exhibition. We can’t recommend it highly enough (not suitable for young children though). 420 square foot room with single king bed. 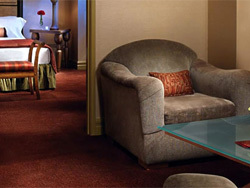 Includes table with two chairs and a flat-screen cable television. The bathroom has oversized shower and sink. 420 square foot room with two queen beds. Includes table with two chairs and a flat-screen cable television. The bathroom has oversized shower and sink. 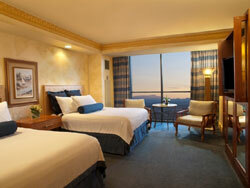 420 square foot room with single king bed or twin queens. Includes table with two chairs and a flat-screen cable television. The bathroom has oversized shower and sink. 449 square foot room with single king bed. Includes table with two chairs and a flat-screen cable television. Large bathroom has separate tub and shower and a lighted make-up mirror. 449 square foot room with single king bed. 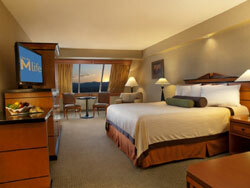 Includes two spacious armoires and a flat-screen cable television. Large bathroom has separate tub and shower and a lighted make-up mirror. 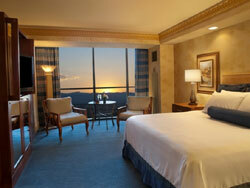 780 square foot suite features a separate bedroom with one king bed, an armchair and a flat-screen TV. Floor to ceiling windows with excellent views. Large living area with second flat-screen TV, couch (no pull-out bed), armchair, breakfast area, small dining table that seats two, wet bar, refrigerator and coffeemaker. Large bathroom with bathtub, separate shower and a dual vanity sink. Large 19,000 square feet with four pools, whirlpool and 125,650 square foot deck. In the summer, Luxor hosts Temptation Sundays, the LGBT pool party. 12 private cabanas are available for hire. There is a tram between Luxor, Mandalay Bay and Excalibur, or else you can walk without ever needing to venturing outside. 120,000 square feet. Casino games include Blackjack, Craps, Roulette, Baccarat, Pai Gow Poker, Poker, Slots, Video Poker and Megabucks. There is also a poker room. 110-seat race and sports book, 128 individual monitors and 5 large screen televisions. More the Buffet at the Luxor. Titanic: The Artifact Exhibition real artefacts from the doomed ocean liner. Also on the Mezzanine floor. Health club or fitness equipment? – Yes. The Luxor Galleria promenade has various retail stores. Fashion 101 on the casino floor. Mandalay Place – mall with 41 shops that connects Luxor to Mandalay Bay. Up to 7,400 square feet, and ballroom with 15,680 square feet of space. 800-number, local, long distance (excluding international) phone calls.